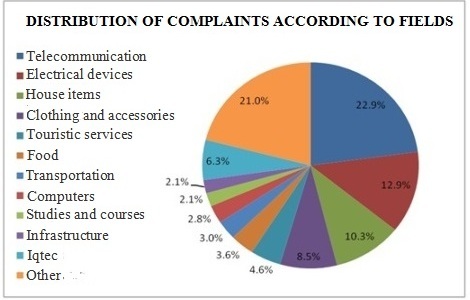 The Israel Consumer Council has released its annual Complaints Report for 2013. According to the report, in 2013, the Council has received about 40,426 complaints, which constitutes an increase of 6 % compared to last year. The report shows that the field of telecommunication leads with a number of complaints reaching 23%. In the second place, "stars" the field area of electrical appliances with 13% of complaints. Third place in the complaints parade is in the field of house items with 10.3% (furniture, kitchens, etc. ), in which many furniture companies were bankrupted. What consumers complained about in 2013? 28% of the consumers complained about issues related to products, 20% about financial matters, 17% about refusal to cancel a transaction and the same percentage about quality of service. How much money did the Council return to consumers? The report shows that it pays to turn to the Consumer Council: The Council led to reimbursement of 5.36 million NIS to consumers who turned to them, when the average refund is of 1,284 NIS per consumer's request. This represents an increase of 34 % compared to last year. The percentage of justified complaints to the Council is approximately 80% and the percentage of success in taking care of the complaints is about 75%. This year, cellular companies "star" in the report, with 3,882 complaints sent to the Consumer Council. In the fields of television and Internet, a significant increase of the number of complaints has also been observed. In the field of purchases for home (furniture, kitchens, bathtubs, etc. ), there has been a significant deterioration towards the consumer with an increase of 23% complaints compared to last year. The Council explains this figure through bankruptcy of eight companies. In clothing and footwear, there was a sharp decline of 13% of the number of complaints received in 2013 compared to 2012. In the field of healthcare, there was a significant increase in the number of complaints against Health Maintenance Organizations (Koupot Holim) (102 %), whereas in sports and fitness rooms, the increase was of 19%. And what are the cities whose residents complained the most? Tel Aviv and Jerusalem are the cities from which most of the complaints were sent, but compared to the number of residents, Ramat Gan is the leader. Five cities in the center with high socioeconomic profile lead the list, while the five cities closing the list are the ones with a majority of Orthodox or Arab residents from lower income groups. Bnei Brak and Beit Shemesh close the list. Adv. Ehud Peleg, CEO of the Israel Consumer Council: "The report shows a bleak picture of a sub-culture of dishonesty, that tarnishes the reality of commercial life in Israel. The infamous method of "success" and abuse of information gaps and power between businesses and consumers, has long ceased to characterize individual cases and became a phenomenon from which suffer many consumers. Through various activities, the Council has managed to provide an answer to all consumers in order to change the consuming power equation. However, there is no other way but enhancing active involvement of the consumers themselves. Their awareness and reaction in cases of violation of their rights, as well as their turning to the variegated Council's services and the extensive information it posts on its website, are complementary and necessary conditions to struggle against unfairness trade and towards a change of commercial culture in Israel."